1) Mizumoto, S., Yamada, S., & Sugahara, K. (2014) BioMed Res. Int., 2014, 495764. 2) Kitayama, K., Hayashida, Y., Nishida, K., & Akama, T.O. (2007) J. Biol. Chem., 282, 30085–30096. 3) Mis, E.K., Liem, K.F. Jr., Kong, Y., Schwartz, N.B., Domowicz, M., & Weatherbee, S.D. (2014) Dev. Biol., 385, 67–82. 4) Bui, C., Huber, C., Tuysuz, B., Alanay, Y., Bole-Feysot, C., Leroy, J.G., Mortier, G., Nitschke, P., Munnich, A., & Cormier-Daire, V. (2014) Am. J. Hum. Genet., 94, 405–414. 5) Quentin, E., Gladen, A., Rodén, L., & Kresse, H. (1990) Proc. Natl. Acad. Sci. USA, 87, 1342–1346. 6) Nakajima, M., Mizumoto, S., Miyake, N., Kogawa, R., Iida, A., Ito, H., Kitoh, H., Hirayama, A., Mitsubuchi, H., Miyazaki, O., Kosaki, R., Horikawa, R., Lai, A., Mendoza-Londono, R., Dupuis, L., Chitayat, D., Howard, A., Leal, G.F., Cavalcanti, D., Tsurusaki, Y., Saitsu, H., Watanabe, S., Lausch, E., Unger, S., Bonafé, L., Ohashi, H., Superti-Furga, A., Matsumoto, N., Sugahara, K., Nishimura, G., & Ikegawa, S. (2013) Am. J. Hum. Genet., 92, 927–934. 7) Baasanjav, S., Al-Gazali, L., Hashiguchi, T., Mizumoto, S., Fischer, B., Horn, D., Seelow, D., Ali, B.R., Aziz, S.A., Langer, R., Saleh, A.A., Becker, C., Nürnberg, G., Cantagrel, V., Gleeson, J.G., Gomez, D., Michel, J.B., Stricker, S., Lindner, T.H., Nürnberg, P., Sugahara, K., Mundlos, S., & Hoffmann, K. (2011) Am. J. Hum. Genet., 89, 15–27. 8) Izumikawa, T., Kanagawa, N., Watamoto, Y., Okada, M., Saeki, M., Sakano, M., Sugahara, K., Sugihara, K., Asano, M., & Kitagawa, H. (2010) J. Biol. Chem., 285, 12190–12196. 9) Saigoh, K., Izumikawa, T., Koike, T., Shimizu, J., Kitagawa, H., & Kusunoki, S. (2011) J. Hum. Genet., 56, 143–146. 10) Watanabe, Y., Takeuchi, K., Higa-Onaga, S., Sato, M., Tsujita, M., Abe, M., Natsume, R., Li, M., Furuichi, T., Saeki, M., Izumikawa, T., Hasegawa, A., Yokoyama, M., Ikegawa, S., Sakimura, K., Amizuka, N., Kitagawa, H., & Igarashi, M. (2010) Biochem. J., 432, 47–55. 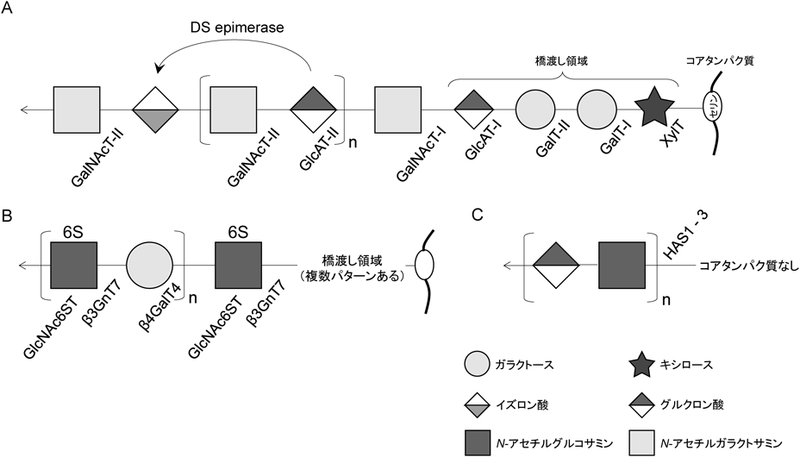 11) Ema, M., Takahashi, S., Kimata, K., Watanabe, H., & Narimatsu, H. (2011) J. Biol. Chem., 286, 5803–5812. 12) Li, Y., Laue, K., Temtamy, S., Aglan, M., Kotan, L.D., Yigit, G., Canan, H., Pawlik, B., Nürnberg, G., Wakeling, E.L., Quarrell, O.W., Baessmann, I., Lanktree, M.B., Yilmaz, M., Hegele, R.A., Amr, K., May, K.W., Nürnberg, P., Topaloglu, A.K., Hammerschmidt, M., & Wollnik, B. (2010) Am. J. Hum. Genet., 87, 757–767. 13) Izumikawa, T., Saigoh, K., Shimizu, J., Tsuji, S., Kusunoki, S., & Kitagawa, H. (2013) Biochim. Biophys. Acta, 1830, 4806–4812. 14) Wilson, D.G., Phamluong, K., Lin, W.Y., Barck, K., Carano, R.A., Diehl, L., Peterson, A.S., Martin, F., & Solloway, M.J. (2012) Dev. Biol., 363, 413–425. 15) Rajab, A., Kunze, J., & Mundlos, S. (2004) Am. J. Med. Genet., 126A, 413–419. 16) Thiele, H., Sakano, M., Kitagawa, H., Sugahara, K., Rajab, A., Höhne, W., Ritter, H., Leschik, G., Nürnberg, P., & Mundlos, S. (2004) Proc. Natl. Acad. Sci. USA, 101, 10155–10160. 17) van Roij, M.H., Mizumoto, S., Yamada, S., Morgan, T., Tan-Sindhunata, M.B., Meijers-Heijboer, H., Verbeke, J.I., Markie, D., Sugahara, K., & Robertson, S.P. (2008) Am. J. Med. Genet., 146A, 2376–2384. 18) Uchimura, K., Kadomatsu, K., Nishimura, H., Muramatsu, H., Nakamura, E., Kurosawa, N., Habuchi, O., El-Fasakhany, F.M., Yoshikai, Y., & Muramatsu, T. (2002) J. Biol. Chem., 277, 1443–1450. 19) Kosho, T., Takahashi, J., Ohashi, H., Nishimura, G., Kato, H., & Fukushima, Y. (2005) Am. J. Med. Genet., 138A, 282–287. 20) Malfait, F., Syx, D., Vlummens, P., Symoens, S., Nampoothiri, S., Hermanns-Lê, T., Van Laer, L., & De Paepe, A. (2010) Hum. Mutat., 31, 1233–1239. 21) Akyüz, N., Rost, S., Mehanna, A., Bian, S., Loers, G., Oezen, I., Mishra, B., Hoffmann, K., Guseva, D., Laczynska, E., Irintchev, A., Jakovcevski, I., & Schachner, M. (2013) Exp. Neurol., 247, 517–530. 22) Müller, T., Mizumoto, S., Suresh, I., Komatsu, Y., Vodopiutz, J., Dundar, M., Straub, V., Lingenhel, A., Melmer, A., Lechner, S., Zschocke, J., Sugahara, K., & Janecke, A.R. (2013) Hum. Mol. Genet., 22, 3761–3772. 23) Maccarana, M., Kalamajski, S., Kongsgaard, M., Magnusson, S.P., Oldberg, A., & Malmström, A. (2009) Mol. Cell. Biol., 29, 5517–5528. 24) Goossens, D., Van Gestel, S., Claes, S., De Rijk, P., Souery, D., Massat, I., Van den Bossche, D., Backhovens, H., Mendlewicz, J., Van Broeckhoven, C., & Del-Favero, J. (2003) Mol. Psychiatry, 8, 83–89. 25) Shi, J., Potash, J.B., Knowles, J.A., Weissman, M.M., Coryell, W., Scheftner, W.A., Lawson, W.B., DePaulo, J.R. Jr., Gejman, P.V., Sanders, A.R., Johnson, J.K., Adams, P., Chaudhury, S., Jancic, D., Evgrafov, O., Zvinyatskovskiy, A., Ertman, N., Gladis, M., Neimanas, K., Goodell, M., Hale, N., Ney, N., Verma, R., Mirel, D., Holmans, P., & Levinson, D.F. (2011) Mol. Psychiatry, 16, 193–201. 26) Bartolini, B., Thelin, M.A., Rauch, U., Feinstein, R., Oldberg, A., Malmström, A., & Maccarana, M. (2012) Glycobiology, 22, 1007–1016. 27) Akama, T.O., Nishida, K., Nakayama, J., Watanabe, H., Ozaki, K., Nakamura, T., Dota, A., Kawasaki, S., Inoue, Y., Maeda, N., Yamamoto, S., Fujiwara, T., Thonar, E.J., Shimomura, Y., Kinoshita, S., Tanigami, A., & Fukuda, M.N. (2000) Nat. Genet., 26, 237–241. 28) Saito, T., Nishida, K., Nakayama, J., Akama, T.O., Fukuda, M.N., Watanabe, K., Quantock, A.J., Maeda, N., Watanabe, H., & Tano, Y. (2008) Br. J. Ophthalmol., 92, 1434–1436. 29) Kobayashi, N., Miyoshi, S., Mikami, T., Koyama, H., Kitazawa, M., Takeoka, M., Sano, K., Amano, J., Isogai, Z., Niida, S., Oguri, K., Okayama, M., McDonald, J.A., Kimata, K., Taniguchi, S., & Itano, N. (2010) Cancer Res., 70, 7073–7083. 30) Bai, K.J., Spicer, A.P., Mascarenhas, M.M., Yu, L., Ochoa, C.D., Garg, H.G., & Quinn, D.A. (2005) Am. J. Respir. Crit. Care Med., 172, 92–98. 31) Camenisch, T.D., Spicer, A.P., Brehm-Gibson, T., Biesterfeldt, J., Augustine, M.L., Calabro, A. Jr., Kubalak, S., Klewer, S.E., & McDonald, J.A. (2000) J. Clin. Invest., 106, 349–360. 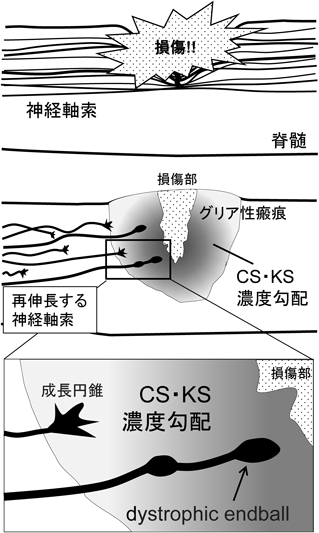 32) Matsumoto, K., Li, Y., Jakuba, C., Sugiyama, Y., Sayo, T., Okuno, M., Dealy, C.N., Toole, B.P., Takeda, J., Yamaguchi, Y., & Kosher, R.A. (2009) Development, 136, 2825–2835. 34) Oshima, A., Tsuji, A., Nagao, Y., Sakuraba, H., & Suzuki, Y. (1988) Biochem. Biophys. Res. Commun., 157, 238–244. 35) Yamamoto, Y., Hake, C.A., Martin, B.M., Kretz, K.A., Ahern-Rindell, A.J., Naylor, S.L., Mudd, M., & O’Brien, J.S. (1990) DNA Cell Biol., 9, 119–127. 36) Morreau, H., Galjart, N.J., Gillemans, N., Willemsen, R., van der Horst, G.T., & d’Azzo, A. (1989) J. Biol. Chem., 264, 20655–20663. 37) Applegarth, D.A. & Bozoian, G. (1972) Clin. Chim. Acta, 39, 269–271. 38) Cantz, M. & Kresse, H. (1974) Eur. J. Biochem., 47, 581–590. 39) Sango, K., McDonald, M.P., Crawley, J.N., Mack, M.L., Tifft, C.J., Skop, E., Starr, C.M., Hoffmann, A., Sandhoff, K., Suzuki, K., & Proia, R.L. (1996) Nat. Genet., 14, 348–352. 40) Fuchs, W., Beck, M., & Kresse, H. (1985) Eur. J. Biochem., 151, 551–556. 41) Tomatsu, S., Fukuda, S., Masue, M., Sukegawa, K., Fukao, T., Yamagishi, A., Hori, T., Iwata, H., Ogawa, T., Nakashima, Y., Hanyu, Y., Hashimoto, T., Titani, K., Oyama, R., Suzuki, M., Yagi, K., Hayashi, Y., & Orii, T. (1991) Biochem. Biophys. Res. Commun., 181, 677–683. 42) Natowicz, M.R., Short, M.P., Wang, Y., Dickersin, G.R., Gebhardt, M.C., Rosenthal, D.I., Sims, K.B., & Rosenberg, A.E. (1996) N. Engl. J. Med., 335, 1029–1033. 43) Barton, R.W. & Neufeld, E.F. (1971) J. Biol. Chem., 246, 7773–7779. 44) Clements, P.R., Brooks, D.A., Saccone, G.T., & Hopwood, J.J. (1985) Eur. J. Biochem., 152, 21–28. 45) Ohshita, T., Sakuda, H., Nakasone, S., & Iwamasa, T. (1989) Eur. J. Biochem., 179, 201–207. 46) Scott, H.S., Guo, X.H., Hopwood, J.J., & Morris, C.P. (1992) Genomics, 13, 1311–1313. 47) Scott, H.S., Litjens, T., Nelson, P.V., Thompson, P.R., Brooks, D.A., Hopwood, J.J., & Morris, C.P. (1993) Am. J. Hum. Genet., 53, 973–986. 48) Scott, H.S., Nelson, P.V., Litjens, T., Hopwood, J.J., & Morris, C.P. (1993) Hum. Mol. Genet., 2, 1471–1473. 49) Clarke, L.A., Nelson, P.V., Warrington, C.L., Morris, C.P., Hopwood, J.J., & Scott, H.S. (1994) Hum. Mutat., 3, 275–282. 50) Bunge, S., Kleijer, W.J., Steglich, C., Beck, M., Zuther, C., Morris, C.P., Schwinger, E., Hopwood, J.J., Scott, H.S., & Gal, A. (1994) Hum. Mol. Genet., 3, 861–866. 51) Yamagishi, A., Tomatsu, S., Fukuda, S., Uchiyama, A., Shimozawa, N., Suzuki, Y., Kondo, N., Sukegawa, K., & Orii, T. (1996) Hum. Mutat., 7, 23–29. 52) Bach, G., Eisenberg, F. Jr., Cantz, M., & Neufeld, E.F. (1973) Proc. Natl. Acad. Sci. USA, 70, 2134–2138. 53) Flomen, R.H., Green, E.P., Green, P.M., Bentley, D.R., & Giannelli, F. (1993) Hum. Mol. Genet., 2, 5–10. 54) Wilson, P.J., Meaney, C.A., Hopwood, J.J., & Morris, C.P. (1993) Genomics, 17, 773–775. 55) Bielicki, J., Freeman, C., Clements, P.R., & Hopwood, J.J. (1990) Biochem. J., 271, 75–86. 56) Froissart, R., Millat, G., Mathieu, M., Bozon, D., & Maire, I. (1995) Biochem. J., 309, 425–430. 57) Wilson, P.J., Morris, C.P., Anson, D.S., Occhiodoro, T., Bielicki, J., Clements, P.R., & Hopwood, J.J. (1990) Proc. Natl. Acad. Sci. USA, 87, 8531–8535. 58) Wehnert, M., Hopwood, J.J., Schröder, W., & Herrmann, F.H. (1992) Hum. Genet., 89, 430–432. 59) Brown, W.J., Goodhouse, J., & Farquhar, M.G. (1986) J. Cell Biol., 103, 1235–1247. 60) Baron, R., Neff, L., Brown, W., Courtoy, P.J., Louvard, D., & Farquhar, M.G. (1988) J. Cell Biol., 106, 1863–1872. 61) Baron, R., Neff, L., Brown, W., Louvard, D., & Courtoy, P.J. (1990) J. Cell Sci., 97, 439–447. 62) Clarke, L.A., Russell, C.S., Pownall, S., Warrington, C.L., Borowski, A., Dimmick, J.E., Toone, J., & Jirik, F.R. (1997) Hum. Mol. Genet., 6, 503–511. 63) Cardone, M., Polito, V.A., Pepe, S., Mann, L., D’Azzo, A., Auricchio, A., Ballabio, A., & Cosma, M.P. (2006) Hum. Mol. Genet., 15, 1225–1236. 64) Bhaumik, M., Muller, V.J., Rozaklis, T., Johnson, L., Dobrenis, K., Bhattacharyya, R., Wurzelmann, S., Finamore, P., Hopwood, J.J., Walkley, S.U., & Stanley, P. (1999) Glycobiology, 9, 1389–1396. 65) Li, H.H., Yu, W.H., Rozengurt, N., Zhao, H.Z., Lyons, K.M., Anagnostaras, S., Fanselow, M.S., Suzuki, K., Vanier, M.T., & Neufeld, E.F. (1999) Proc. Natl. Acad. Sci. USA, 96, 14505–14510. 66) Roca, C., Motas, S., Marcó, S., Ribera, A., Sánchez, V., Sánchez, X., Bertolin, J., León, X., Pérez, J., Garcia, M., Villacampa, P., Ruberte, J., Pujol, A., Haurigot, V., & Bosch, F. (2017) Hum. Mol. Genet., 26, 1535–1551. 67) Tomatsu, S., Orii, K.O., Vogler, C., Nakayama, J., Levy, B., Grubb, J.H., Gutierrez, M.A., Shim, S., Yamaguchi, S., Nishioka, T., Montano, A.M., Noguchi, A., Orii, T., Kondo, N., & Sly, W.S. (2003) Hum. Mol. Genet., 12, 3349–3358. 68) Matsuda, J., Suzuki, O., Oshima, A., Ogura, A., Noguchi, Y., Yamamoto, Y., Asano, T., Takimoto, K., Sukegawa, K., Suzuki, Y., & Naiki, M. (1997) Glycoconj. J., 14, 729–736. 69) Evers, M., Saftig, P., Schmidt, P., Hafner, A., McLoghlin, D.B., Schmahl, W., Hess, B., von Figura, K., & Peters, C. (1996) Proc. Natl. Acad. Sci. USA, 93, 8214–8219. 70) Sands, M.S. & Birkenmeier, E.H. (1993) Proc. Natl. Acad. Sci. USA, 90, 6567–6571. 71) Martin, D.C., Atmuri, V., Hemming, R.J., Farley, J., Mort, J.S., Byers, S., Hombach-Klonisch, S., Csoka, A.B., Stern, R., & Triggs-Raine, B.L. (2008) Hum. Mol. Genet., 17, 1904–1915. 72) Frischknecht, R., Heine, M., Perrais, D., Seidenbecher, C.I., Choquet, D., & Gundelfinger, E.D. (2009) Nat. Neurosci., 12, 897–904. 73) Sakamoto, K. & Kadomatsu, K. (2017) Biochim. Biophys. Acta, in press. 74) Orlando, C., Ster, J., Gerber, U., Fawcett, J.W., & Raineteau, O. (2012) J. Neurosci., 32, 18009–18017, 18017a. 75) Pizzorusso, T., Medini, P., Berardi, N., Chierzi, S., Fawcett, J.W., & Maffei, L. (2002) Science, 298, 1248–1251. 76) Miyata, S., Komatsu, Y., Yoshimura, Y., Taya, C., & Kitagawa, H. (2012) Nat. Neurosci., 15, 414–422., S1–S2. 77) Takeda-Uchimura, Y., Uchimura, K., Sugimura, T., Yanagawa, Y., Kawasaki, T., Komatsu, Y., & Kadomatsu, K. (2015) Exp. Neurol., 274(Pt B), 145–155. 78) Gogolla, N., Caroni, P., Lüthi, A., & Herry, C. (2009) Science, 325, 1258–1261. 79) Tuszynski, M.H. & Steward, O. (2012) Neuron, 74, 777–791. 80) Lee, J.K., Geoffroy, C.G., Chan, A.F., Tolentino, K.E., Crawford, M.J., Leal, M.A., Kang, B., & Zheng, B. (2010) Neuron, 66, 663–670. 81) McKeon, R.J., Schreiber, R.C., Rudge, J.S., & Silver, J. (1991) J. Neurosci., 11, 3398–3411. 82) Davies, S.J., Goucher, D.R., Doller, C., & Silver, J. (1999) J. Neurosci., 19, 5810–5822. 83) Ramon, Y., Cajal, S., & May, R.M. (1928) in Degeneration and Regeneration of the Nervous System, Oxford University Press, London. 84) Davies, S.J., Fitch, M.T., Memberg, S.P., Hall, A.K., Raisman, G., & Silver, J. (1997) Nature, 390, 680–683. 85) Silver, J. & Miller, J.H. (2004) Nat. Rev. Neurosci., 5, 146–156. 86) Bradbury, E.J., Moon, L.D., Popat, R.J., King, V.R., Bennett, G.S., Patel, P.N., Fawcett, J.W., & McMahon, S.B. (2002) Nature, 416, 636–640. 87) Shen, Y., Tenney, A.P., Busch, S.A., Horn, K.P., Cuascut, F.X., Liu, K., He, Z., Silver, J., & Flanagan, J.G. (2009) Science, 326, 592–596. 88) Lang, B.T., Cregg, J.M., DePaul, M.A., Tran, A.P., Xu, K., Dyck, S.M., Madalena, K.M., Brown, B.P., Weng, Y.L., Li, S., Karimi-Abdolrezaee, S., Busch, S.A., Shen, Y., & Silver, J. (2015) Nature, 518, 404–408. 89) Coles, C.H., Shen, Y., Tenney, A.P., Siebold, C., Sutton, G.C., Lu, W., Gallagher, J.T., Jones, E.Y., Flanagan, J.G., & Aricescu, A.R. (2011) Science, 332, 484–488. 90) Jones, L.L. & Tuszynski, M.H. (2002) J. Neurosci., 22, 4611–4624. 91) Ito, Z., Sakamoto, K., Imagama, S., Matsuyama, Y., Zhang, H., Hirano, K., Ando, K., Yamashita, T., Ishiguro, N., & Kadomatsu, K. (2010) J. Neurosci., 30, 5937–5947. 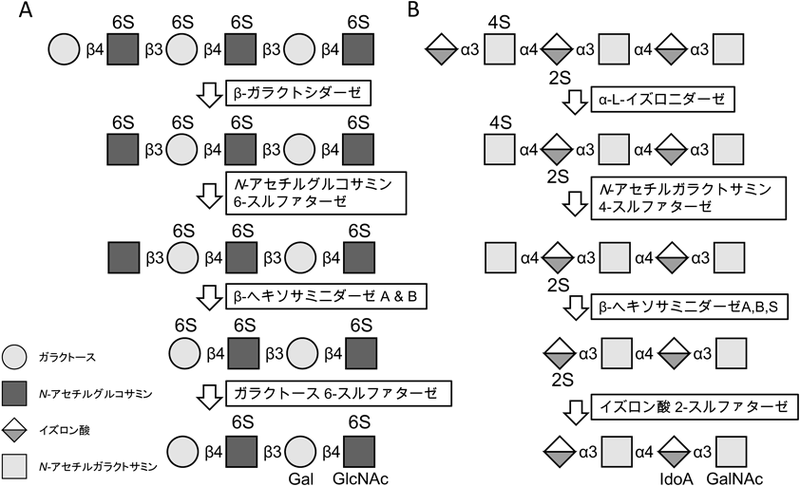 92) Zhang, H., Muramatsu, T., Murase, A., Yuasa, S., Uchimura, K., & Kadomatsu, K. (2006) Glycobiology, 16, 702–710. 93) Imagama, S., Sakamoto, K., Tauchi, R., Shinjo, R., Ohgomori, T., Ito, Z., Zhang, H., Nishida, Y., Asami, N., Takeshita, S., Sugiura, N., Watanabe, H., Yamashita, T., Ishiguro, N., Matsuyama, Y., & Kadomatsu, K. (2011) J. Neurosci., 31, 17091–17102. 94) Tom, V.J., Steinmetz, M.P., Miller, J.H., Doller, C.M., & Silver, J. (2004) J. Neurosci., 24, 6531–6539. 95) Tojima, T., Hines, J.H., Henley, J.R., & Kamiguchi, H. (2011) Nat. Rev. Neurosci., 12, 191–203. 96) Vitriol, E.A. & Zheng, J.Q. (2012) Neuron, 73, 1068–1081. 97) Foyez, T., Takeda-Uchimura, Y., Ishigaki, S., Narentuya, Zhang, Z., Sobue, G., Kadomatsu, K., & Uchimura, K. (2015) Am. J. Pathol., 185, 3053–3065. 98) Zhang, Z., Takeda-Uchimura, Y., Foyez, T., Ohtake-Niimi, S., Narentuya, Akatsu, H., Nishitsuji, K., Michikawa, M., Wyss-Coray, T., Kadomatsu, K., & Uchimura, K. (2017) Proc. Natl. Acad. Sci. USA, 114, 2947–2954. 99) Nishitsuji, K. & Uchimura, K. (2017) Glycoconj. J., in press.